One moment I was an energetic, vibrantly healthy woman just getting my teeth cleaned and in the blink of an eye – as long as it took to put an antibiotic in my gum – my life changed, and I was on my way to a health crisis I never could’ve imagined! Those were the words the surgeon spoke to me after three weeks of severe constipation and a serious blockage caused by an antibiotic. It was weeks of using numerous laxatives, enemas and what seemed like never-ending days of discomfort, anxiety, and fear, not being able to eat or drink much and four days of invasive, painful tests in the hospital before the doctors came to this conclusion. Never in a million years did I imagine I would find myself in this situation! As a holistic health coach, I am very aware of the importance of good diet and proper supplementation. I avoid medications and drugs unless absolutely necessary, so to have what everyone involved considered a “harmless” dental antibiotic be the cause of this serious health crisis was almost beyond my ability to comprehend. This is life though, isn’t it? There are days full of sunshine and balmy breezes, and there are dark, tempestuous storms, times that truly test our faith. I knew beyond the shadow of a doubt that God had not caused this. But I knew He could and would bring great good out of it. Of that, I had no doubt. I know my God is a good God and that if He allowed this, it was not to destroy me. Yes, this was a very real situation but something my mother used to say all the time kept coming to me – “this too shall pass.” It was not a permanent situation, but a temporary one. Surgery would be over in a matter of hours. Recovery would take much longer, but that too would conclude. Healing would begin. We tend to take for granted that things will just continue as they have been. When we are faced with trouble or a crisis it shocks us. But I wonder if that’s even logical. We live in an imperfect world, and we are imperfect people who make mistakes. We do things that hurt each other, and we even hurt ourselves and often don’t even realize what we’re doing or why. I came out of this major surgery and spent another six days in the hospital. I had a temporary ostomy bag while my colon healed. The change happened in the blink of an eye. Returning to normal life, however, would not be quite that fast. From the beginning, I refused to ask “why.” Friends and family who know me well were flabbergasted at this turn of events and kept saying they couldn’t believe this could happen to me. But why not? No one does everything perfectly so, here is where I found myself. I could spend days drowning in self-pity or be thankful to still be here. The choice was mine. I am living proof that you can go through the worst storm, continue trusting God and come through it stronger, smarter and better than before. Now three years later I can tell you I have! I am back to vibrant health, working out daily. I was blessed to witness the birth of my first grandchild last year and to see my oldest son married recently. I grieved the sudden loss of my wonderful father. While life will never be “perfect” or without sadness or loss, I am so thankful for the opportunity to be here to experience every aspect of it. While I wouldn’t ever choose to repeat this crisis, I am grateful for all I learned about myself and life through the experience including how to ask for and receive help with grace, from my children and even from strangers; why taking baby steps became my way of life; giving myself permission to rest rather than push through; and relinquishing control over what I normally could do, like letting go of cooking all our traditional Easter foods. It may not sound profound, but the lessons I learned were life-changing for me. Join One Ripple and help create a ripple of Peace, Love, and Kindness around the World! 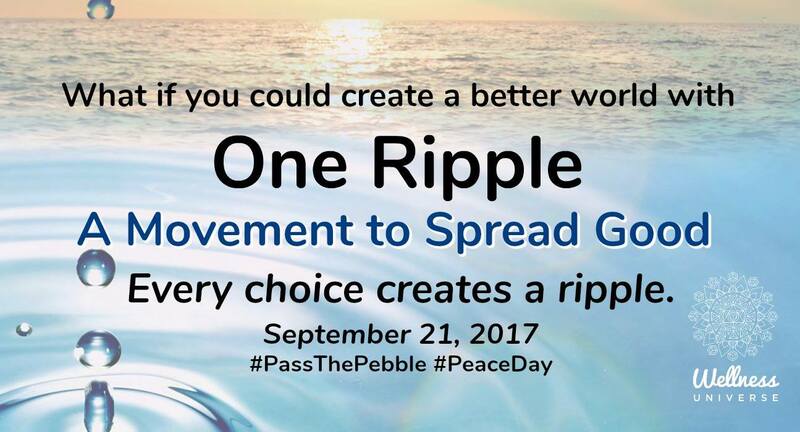 Join The Wellness Universe on September 21st, 2017, in honoring U.N. International Day of Peace by joining the One Ripple movement. Let’s use social media to create something beautiful, together!